Interesting to see the Czech Consul in there with the major US brands. And not cheap, either ($267, matching the Smith-Corona Sterling). But at $374 for a Smith-Corona Galaxie portable, it's no wonder sales started to go down and production moved off-shore. The Royal obviously could be built much more cheaply in Holland. The Royalite undercuts the Smith-Corona Sky(w)riter by almost $50! Interesting post. Used to sell some hardware items to Belknap back in the 70's - didn't know they sold typewriters. 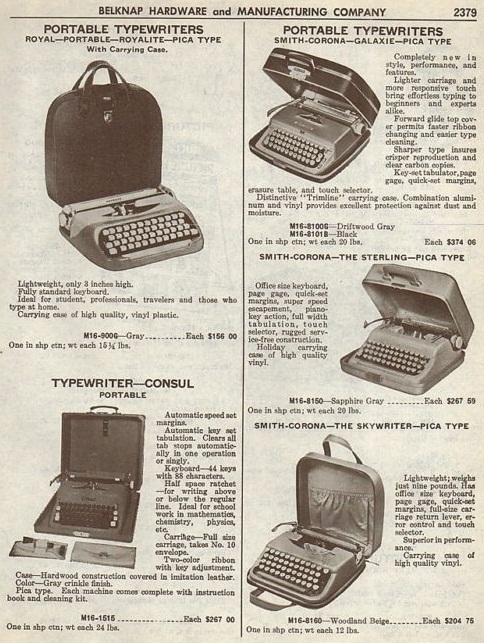 Most of their sales were to hardware stores who obviously used typewriters for correspondence. Thanks. Fascinating glimpse into what was on the market back then. I guess I should stop moaning that typewriter prices are rising lately -- dollar for dollar, they were quite expensive "back in the day"! Thank you, Luddite Shaw (I'm a fellow Luddite, by the way!). Thanks, Cameron. I totally agree with you about prices today: I could hardly believe they were asking more than $300 for a portable back then. I'm trying to remember what I paid for a brand new Olivetti Lettera 32 in 1965: I'm sure it was much less than that. In the U.S. (at the Bon Marche, a Seattle department store, a Royalite was around $60 in 1961; the Skyriter was also around $60. I am wondering if those prices were for a larger number, as in a crate of them in bulk. I think it would say so it they were a bulk buy at these prices. But the prices you cite closer to the 1939 prices (see earlier Smith-Corona Christmas price post).